How Much Will Swelling Go Down After Breast Implant Procedure? Thank you for your question. Swelling is not uncommon in the days following surgery. Over time, swelling diminishes and breast appearance improves. It is very common for there to be differences in natural breasts in terms of shape, height, projection and/or size. I regularly address breast asymmetry during the breast augmentation surgery and in most cases the asymmetry can be greatly improved or eliminated. Some types of asymmetry are difficult to address with the augmentation procedure only and may require an additional corrective procedure, depending on the extent of the asymmetry. All my augmentation patients determine what implant size is correct for them pre-operatively using sizers during the consultation process. They find this process very helpful in determining what features (volume, projection, shape) of various implants best accomplish their unique aesthetic goals. In my practice, most patients prefer submuscular (under the muscle), cohesive gel implants to submammary (over the muscle), saline implants as you are considering. It really depends on the look you are seeking to achieve. I offer all implant styles and variations from both Allergan and Mentor manufacturers. Cohesive gel implants, placed under the muscle, provide the most natural looking and natural feeling breasts, with no ripples. In terms of the post-operative period, some patients feel good enough to go back to work the next day, as long as their job doesn’t require any lifting. Others prefer to take a couple days off. Attending follow-up appointments and adhering to post-operative instructions will optimize your outcome and minimize any swelling, sense of tightness or discomfort. I hope I have answered your questions. Please feel free to make an appointment to discuss any additional queries in person. All the Best. 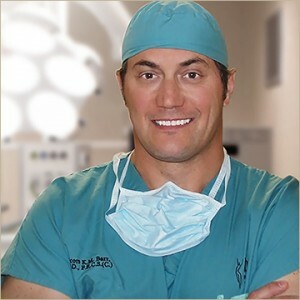 Scott Barr, MD, FRCSC, Plastic Surgeon.